Michael Smith had a fished the rising tide along Pipemakers. Michael worked hard for a few bream not the biggest size but great fighters. All catches on Zman grubs 2′ in motor oil. Michael Used 4lbd braid with 4lb fluorocarbon leader. 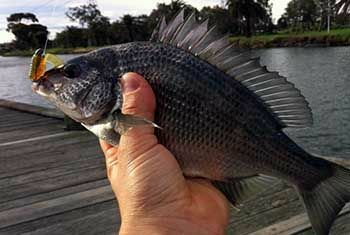 All bream upstream basically took lures beneath feet along bank in fading light within 25 minutes. Pipemakers Park fish were all taken further out allowing incoming tide to drift lures in on retrieve with a few sharp twitches and pauses in between. Thanks Michael we appreciate the report.